* Rosslyn's skyscrapers are compressed in a very dense area giving it that urban feel I was looking for. On October 5th I participated in Scott Kelby's 6th Annual Worldwide Photo Walk and wanted to share the experience and talk a little about the walk itself. 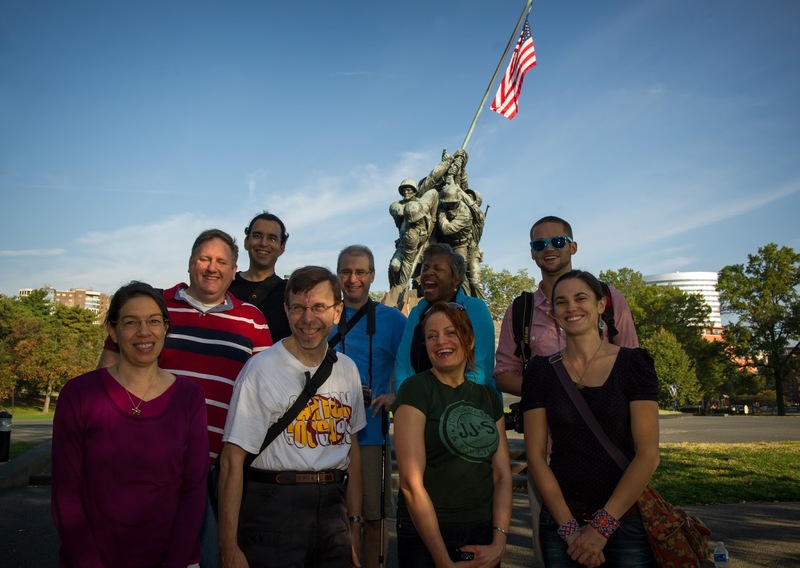 Last year I was part of a walk around the U.S. Capitol in Washington, D.C., and following that experience decided that I wanted to lead a walk in 2013. Not because it wasn't a good experience, but mostly that I was surprised at the time that there wasn't a walk in Arlington, Va., where I live. So when the 2013 date was announced I applied to be be a leader and was accepted. Ultimately 12 photographers signed up and I ended up walking with ten. As I already said, I've known since last year that I wanted to lead a walk in Arlington, so the first thing I needed to do was find a location that would be interesting enough photographically for the two hour walk. Since I live in Arlington, I spend a good deal of time walking around the area with my camera, although most of the time I return home without taking a single photograph, which probably should have been a clue as to why there wasn't a walk here. 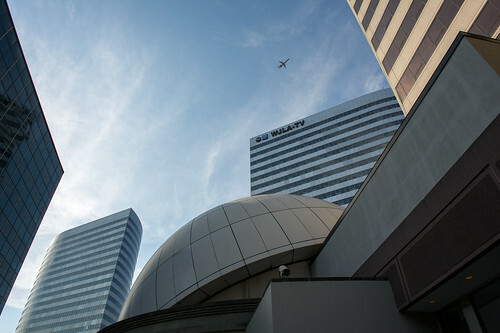 Well that was what I was thinking until I found myself in Rosslyn one morning and all of a sudden I was seeing all kinds of things to photograph. I knew then that I had a solid location for a walk. Dark Star Park is just one of the many green spaces located in Rosslyn that I felt offered a contrast to the steel and concrete of the urban landscape. For those that are unfamiliar with Northern Virginia, Rosslyn is located in the northeastern corner of Arlington County just over Potomac River from Georgetown and adjacent to the U.S. Marine Corps War Memorial and Arlington National Cemetery. What I find really unique about Rosslyn though is the many skyscrapers located in a relatively small area making it seem much more urban or city like, even compared to Washington, D.C.
Elevated walking paths and parks are another thing that make Rosslyn unique and provided the perfect route and theme for our walk. The light, shadows, textures, reflections, shapes and contrasts make it an excellent location for photography. While there is no specific theme as part of the Worldwide Photo Walk, as a leader I think it helps to point out why you picked a specific location and share some thoughts about it with your group. Remember that there are all skill levels that will potentially join you and some may be looking for inspiration and ideas. The U.S. Marine Corps War Memorial was a great place to meet and get started on our photo walk. I choose the U.S. Marine Corps War Memorial as a meeting location, mostly because it is a known landmark, making it easy to find, has open space so I didn't miss anyone as they arrived and most important, there is free parking. The government shutdown meant the parking went away, but I think it was still a good place to meet and take a few photos before we began our urban exploration. Dark Star Park is a unique space in Rosslyn and worth the visit. After about ten minutes photographing the U.S. Marine Corps War Memorial, we moved on to Dark Star Park which sits on a small patch of land as you enter Rosslyn from the Fort Meyer area. 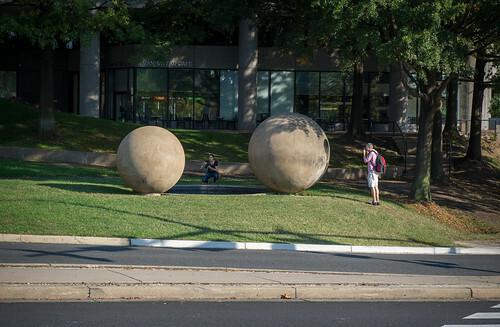 The park consists of a series of concrete spheres, reflecting pools, a large tunnel as well as steel poles and each year on August 1st, at 9:32 a.m., the sun casts shadows which then align with permanent patterns on the ground. I've always been fascinated by this park and it was the reason I found myself in Rosslyn taking pictures in the first place. And even though it is a very small area, every time I visit I find very different photographs to take and knew it would be interesting for the group. Freedom Park seems to float between buildings and even offers a view of Washington, D.C., and the Washington Monument. We next made our way through Freedom Park, a two block long elevated park originally constructed as a automobile overpass. This park seems to float between buildings and gives you some excellent elevated views of Rosslyn and even a glimpse of Washington, D.C., in the distance. It is a wonderful place to explore reflections and shadows, concrete and greenery, and depending on the time of day, offers very different looks. Initially the group moved through the park rather quickly which surprised me because I choose this location because of all the angles, shadows and shapes it presented. I then noticed that many went back to the beginning and really began to explore and take that second look. Maybe that is what I did the first time I visited this location, so remember that even if you have explored a location multiple times, this is probably the first time your walkers visited. Walkers make their way into Freedom Park. Two entrances to the park did allow walkers to spread out a bit. It is important, especially with a very large group that you give the photographers space to move around and stay out of each others way. As a walk leader you need to keep the group on pace, but you also don't want to rush anyone, especially if it looks like they are really feeling a location. Two hours goes by fast and while I thought about adjusting the itinerary and ending here, I did push on and the group began to spread out during the transition to the final location which I didn't want to happen. Remember this was only a group of ten, so imagine if you had 30 or even 50 photographers. Gateway Park is larger than it first appears and offers lots of spaces to explore with your camera. 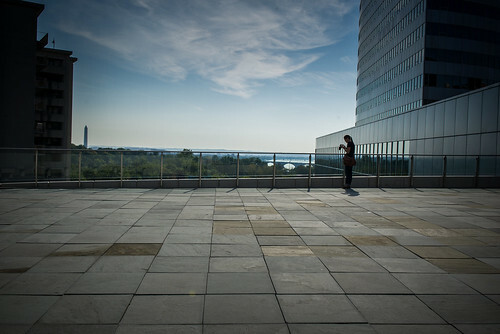 Our final location was Gateway park which is located close to the Potomac River and the Key Bridge. 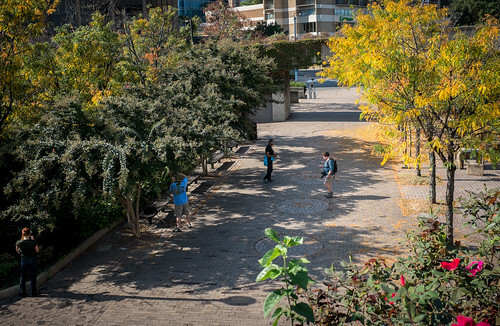 This park features a large tiered green space leading into a series of concrete elevations and walkways which again have you looking down on the streets or the park and when followed allows you cross back towards Rosslyn. It really was a fun day and I enjoyed meeting new people and sharing a few hours with other photographers taking pictures and talking photography. If you have a great idea or location for a walk, I encourage you to apply to be a leader in 2014. I made getting a group photo right a the start, and then sharing it, a priority. I already know I want to lead another walk in Arlington and whether I choose Rosslyn again or opt for a different part of the county, I know I'll have all year to explore and figure it out. If you participated in this year's walk, either as a leader or as a participant, and have something to add, feel free to leave a comment below. 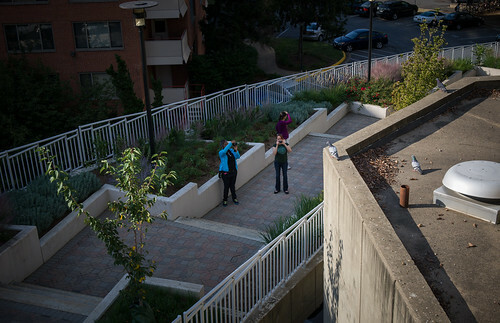 2014 by the Numbers: 1238 photo walks, 28456 participants. * This is one of the few photographs I took that day that didn't involve documenting the walk. As a leader I believe you have the responsibility to ensure your walkers are getting the full experience and you can't really do that and spend all you're time shooting. Your time to take photos is when you visit the location prior to the walk which also means you can offer tips and suggestions on what to photograph for those walkers that ask.